As you can see below, GBP/NZD started the new week by gapping lower and then quickly closing those gaps. And in the process all open trades from last Friday (Nov. 30) were finally closed. And since the final results are finally in, it’s time for another monthly evaluation. 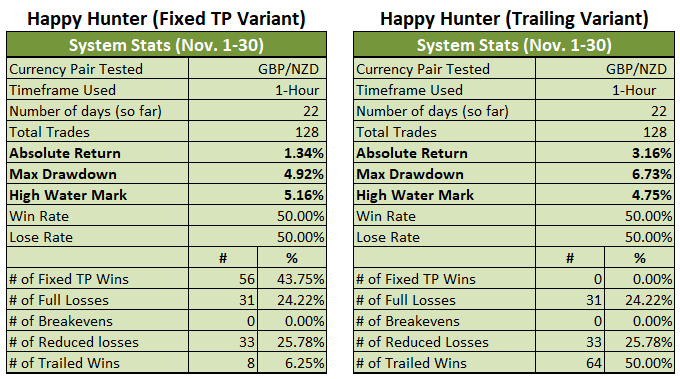 So, how did the two Variants of the Happy Hunter fare in November? Well, if you wanna know, then go ahead and click on the relevant jump links below for the deets (or just scroll down). 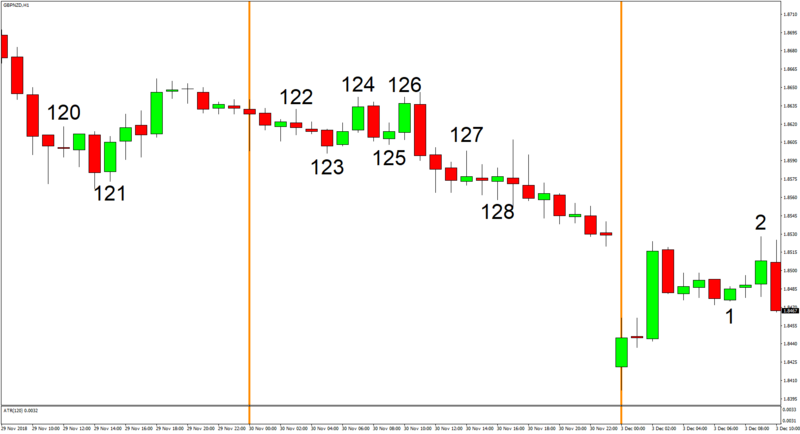 Regular readers probably know that the Trailing Variant was set to close out the month in the red last Friday, but there was still hope since there were a bunch of open trades. And fortunately, all those open trades were closed out with profits. Even better, the profits were large enough that the Trailing Variant was even able to outperform the Fixed TP Variant by closing out the month with 3.16% in gains. 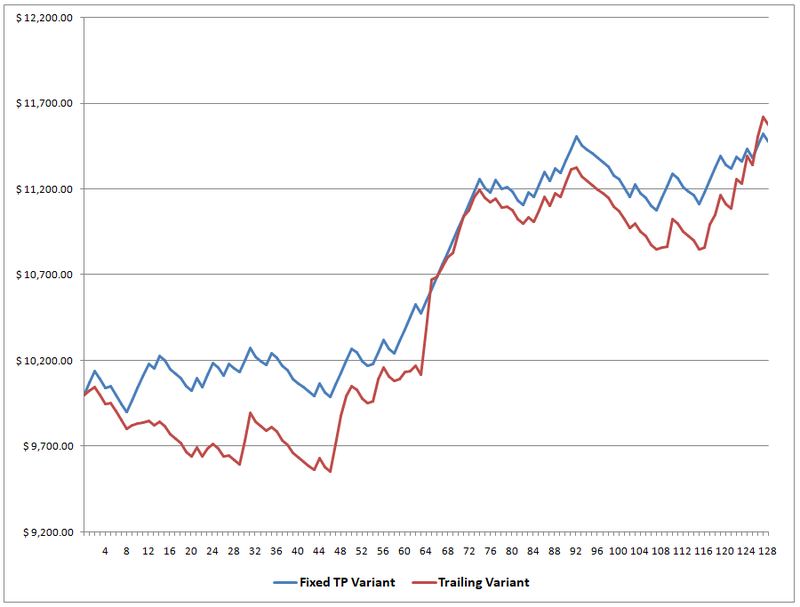 In contrast, the Fixed TP Variant was only able to capture 1.34% in gains for the month. Now that’s a clear example of snatching victory from the jaws of defeat if I ever saw one! 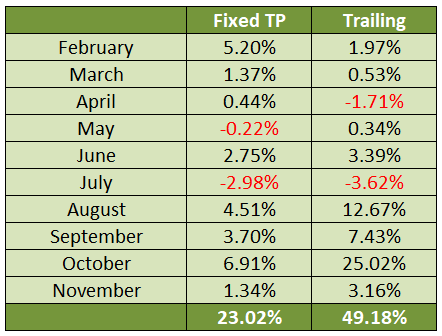 And thanks to the gains harvested in November, both Variants continue to boast very impressive numbers for the entire forward testing period, with the Fixed TP Variant now up by 23.02% after 10 months, while the Trailing Variant is now up by 49.18%. 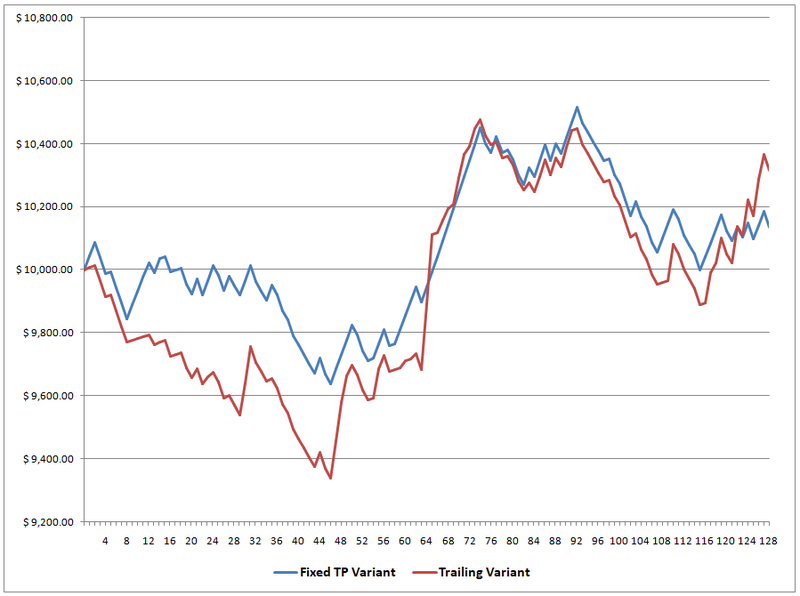 And again, do keep in mind that each and every trade assumes a fixed 12-pip spread. 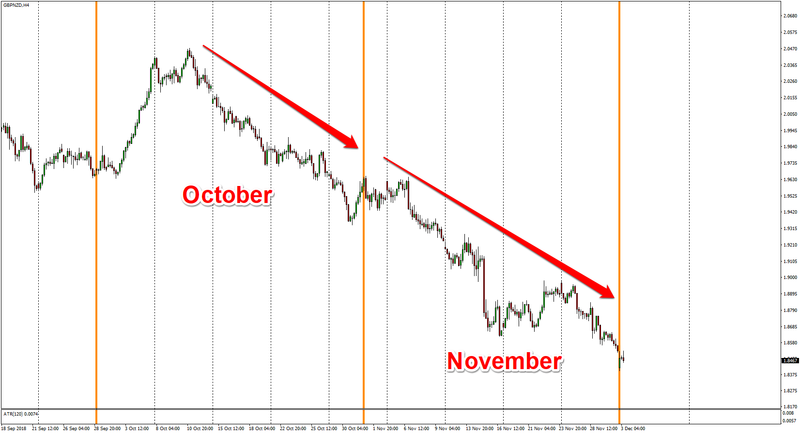 Interestingly enough, November’s price action was basically just a continuation of the downtrend that started in October. But why did both Variants severely under-perform when compared to October’s stellar performance, I hear none of you ask? Well, that’s because trading conditions were actually poorer in November. 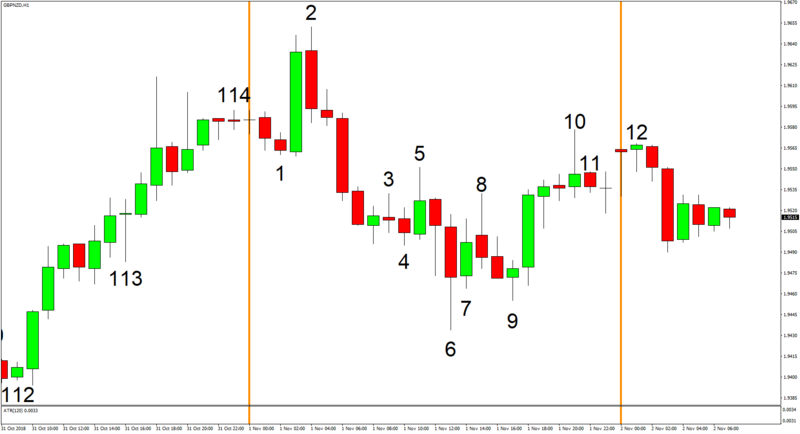 The average daily range in November, for example, was 198 pips, which is more than the 189 pips recorded in October and is also the highest reading for the whole forward-testing period to boot. However, November’s average daily range is only higher because of the 490-pip downtrend on November 15. 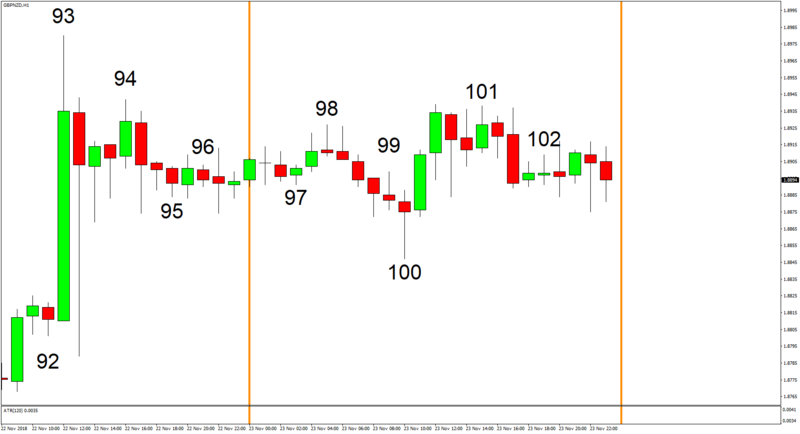 If we exclude that one day, then the average daily range for November drops to just 184 pips, which is less than the 189 pips recorded in October. 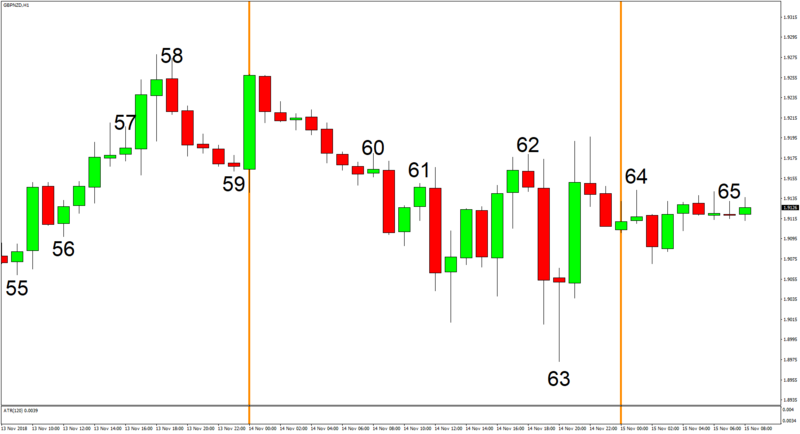 Moreover, the hourly candles in November were bigger, which resulted in more trades getting kicked out prematurely and, in the case of the Trailing Variant, made it much harder to preserve profits. 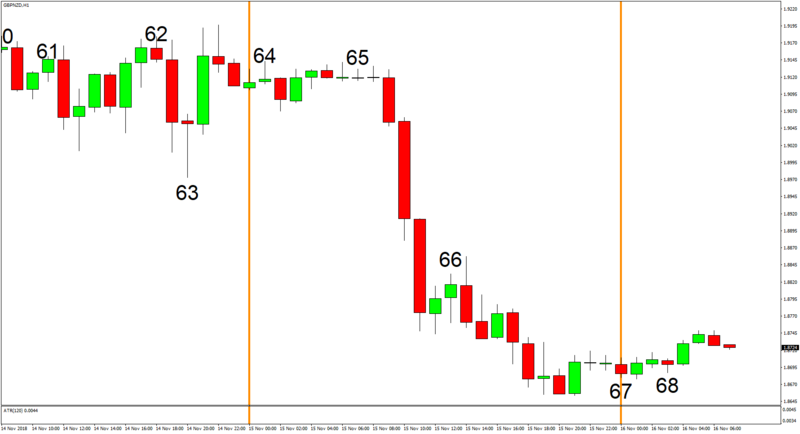 The large hourly candles also meant that the lot size used was generally smaller, which resulted in less profits. 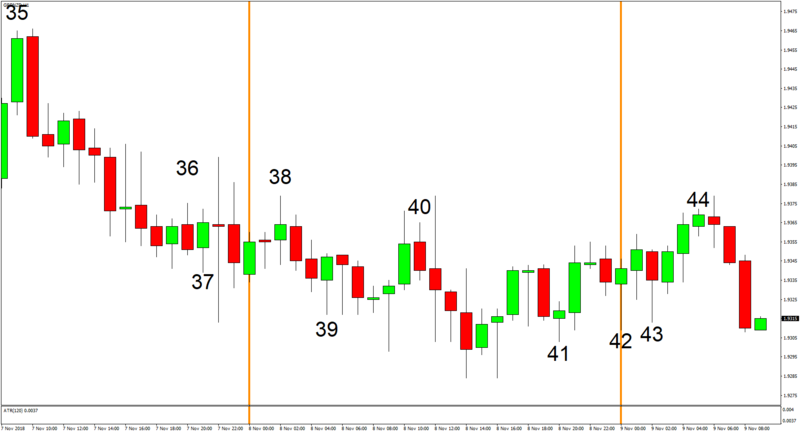 And for reference the average range for the hourly candles in November was 37 pips, while the average hourly range in October was only 31 pips. And again, do keep in mind that the average daily range in November was smaller if we exclude the 490-pip downtrend on November 15, so the average daily range was smaller but the hourly candles were bigger. As for the lot size used, the average lot size in November was 0.11 while the average lot size in October was 0.13, so yeah, the profit potential in November was certainly less, especially for the Trailing Variant. And the final reason why the system didn’t fare as well in November is that GBP/NZD’s intraday price action was rather choppy, so lots of losing trades were triggered and the Trailing Variant had a really hard time trying to ride the multi-day trends. And here are a few examples to show y’all just how ugly intraday price action was in November. With that out of the way, it’s time to give the actual evaluation. But before that, let’s respect the time-honored tradition of fantasizing about the system’s performance if we lived in a fantasy, zero-spread world. Pretty big difference in performance, yeah? Anyhow, enough of that. It’s time for the actual evaluation. And as a refresher, here are the main goals I had for the system when I laid down my plans in My 2018 Trading Resolution way back in January. As usual, let me just highlight that monthly profit targets are not listed in my goals since the system is still in the forward-testing phase. Both Variants did not exceed the 20% drawdown threshold in November, which is great. Both Variants also have yet to breach the 10% “panic level” so I can check that off my list of goals. 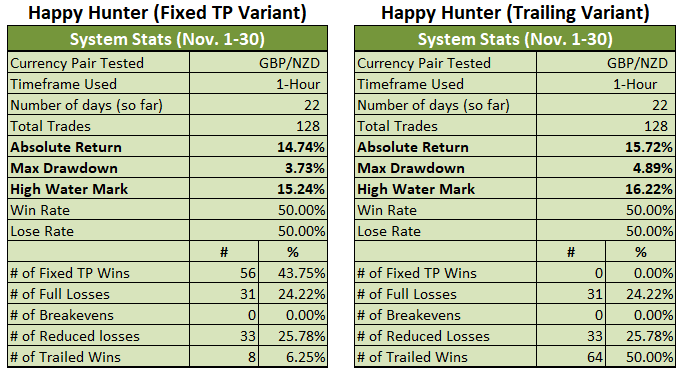 With regard to the goal to have a reward-to-risk ratio of 1:1 or better, I’ll just skip that as usual, since that’s not really applicable since the Trailing Variant has no set TP while the Fixed TP Variant has a reward-to-risk ratio that is inherently less than 1:1 because of the relatively large 12-pip spread. As for the third critical goal, there was at least one trade per day in November, so we can happily check the third goal off our list. As for the fourth goal, that’s still in progress and we won’t know until next year. Both Variants are very well in the green for the year so far, though, so it’s almost guaranteed that we’ll meet this goal. And for the fifth goal to have a winning month (each month, every month), well, the Trailing Variant already messed up on that goal way back in April, while the Fixed TP Variant failed to meet that goal back in May. Overall, both Variants are still meeting my critical goals, with the exception of my goal to have a winning month, each and every month. And while I don’t really have a growth target and while there is still some ways to go until the forward testing period ends, it’s worth noting that both Variants are printing very impressive numbers for the whole forward testing period.